The Living Well HealthMaster Fruit and Vegetable Emulsifier is truly a kitchen appliance breakthrough. It does more than any ordinary blender can ever do. You can use it to make cold foods like smoothies, ice creams, and sorbets. You can use it to make hot robust soups and sauces. Best of all, the HealthMaster is specially designed to retain vitamins, minerals, antioxidants, and phyto-nutrients from fruits and vegetables. The possibilities are endless with the HealthMaster. This incredible unit is designed to do jobs of 31 different kitchen appliances. You can use it to grind smooth or chunky nut butters, grate cheese from coarse to fine, dice eggs and onions, and even melt chocolate and cheese without any scalding. 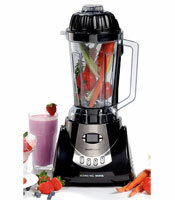 No other blender can come close to what the HealthMaster does. Plus it is built with commercial grade culinary blades that will stay sharp while the simple one-touch settings makes it easy to use. You can order Health Master for four payments of $49.99 plus the cost of shipping and handling. As a special bonus you’ll receive 4 recipe books and eating plans. share it with us and leave a comment. updates in your email !